Log-in here if you’re a member with access to our B.I.G. Tips reports. Twelve stocks in the Nasdaq 100 are currently rated as “uptrending” with “good” or “perfect” timing based on our proprietary “Trend” and “Timing” algorithms. These algos analyze the price action of every stock on a daily basis. It’s not a perfect algo just yet, but it is a great starting point for finding new opportunities or monitoring an existing portfolio. 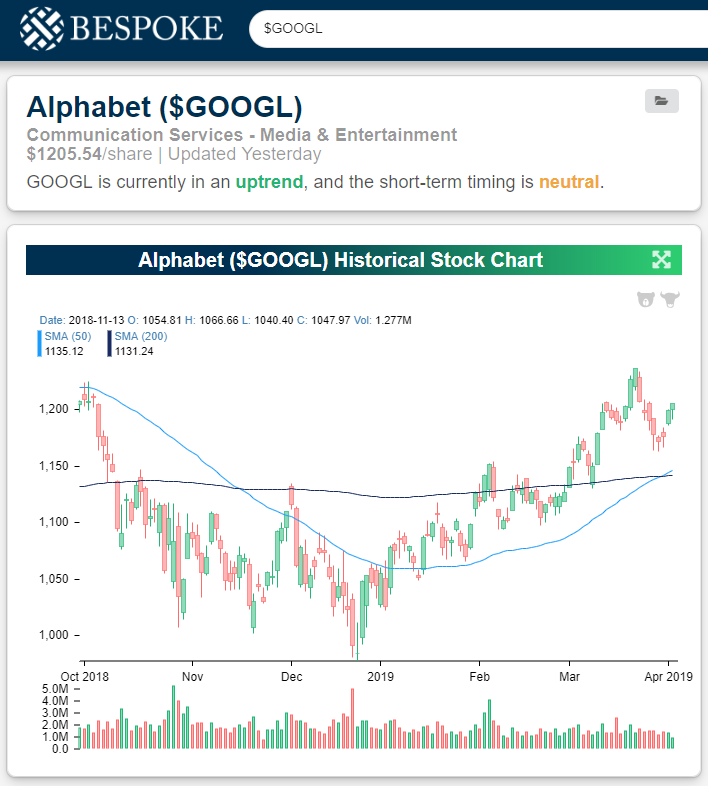 In our new Tools section, you can pull up trend and timing ratings with our Trend Analyzer, and you can also see the trend and timing scores for individual stocks or ETFs when you search for them in our Search bar. Here’s an example using Alphabet (GOOGL). If you’d like to build a custom portfolio of stocks and/or ETFs to monitor, simply head to our Custom Portfolios section and get started. A stock will receive an “uptrend” rating if its price has made a series of higher highs and higher lows over the last six months. In terms of timing, anything that is trading overbought or extremely overbought will be considered “neutral” at best and “bad” in extreme scenarios. Before adding to or buying a new position, we’d prefer to wait for downside mean reversion to occur if the stock is trading at extremely overbought levels. A stock that is trending higher but trading inside of its “normal” trading range will have a “good” timing score — meaning it’s okay to enter the position. If a stock is uptrending but has moved to oversold territory, it becomes even more attractive from a timing perspective. In these instances, though, you’ll sometimes find that our algo doesn’t quite capture a stock that has just recently broken down, so that’s why it’s important to add in the ‘human touch’ and pull up a price chart for each individual name you’re interested in using the Search bar. To continue reading and see which Nasdaq 100 stocks are currently in an uptrend with “good” timing scores, you’ll need to start a two-week free trial to Bespoke Premium. CLICK HERE to start your free trial now.